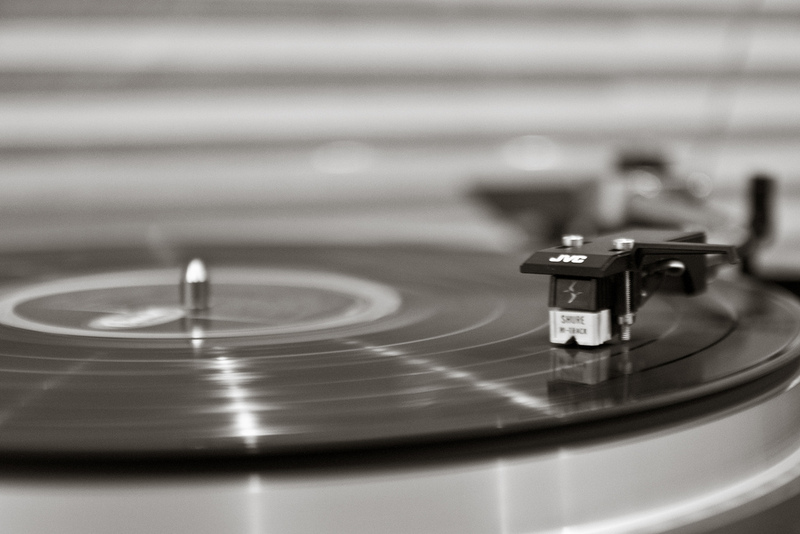 Looking for new ways to capture customer attention through the New Year and beyond? The answer just might be found in an approach that combines classic and traditional looks with modern, trendy, and cutting edge: “Green Edge”…as in Glass Green Photo Frames, Poster Holders, and POP Displays. 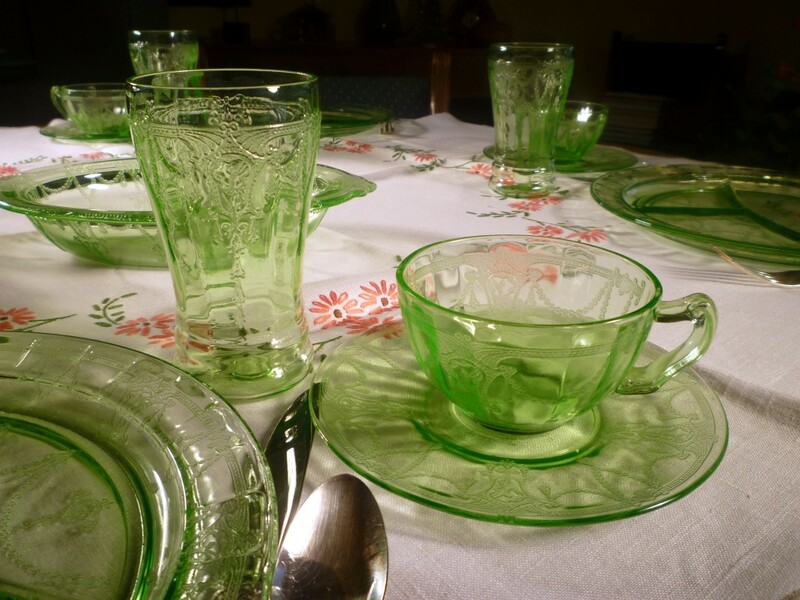 The eye-catching allure of Glass Green actually traces back to a larger family of colored glass in Ancient Egyptian art and Roman Empire architecture. Those ancient glass-making techniques found a resurgence in the 19th century with Cameo glass, and that appeal transcended into the realm of marketing in a new 20th century economy. Today, that nostalgic look is once again riding a wave of popularity in marketing…and that in turn is translating into profitable business use. Recognizing the strength of Glass Green in Premium Plastic Sign Holders is where Plastic Products Mfg (PPM) gives distinct advantages – not just to retail operations and professional centers – but also to universities, hospitals, and executive building signage. The new wave of Style W2 Glass Green Photo Frames also symbolizes the color of money where it flows most freely: in casinos. By implementing classic Glass Green in Photo Frames and Poster Holders, the broad use of this specialized plastic is finding new audiences in a broad range of venues. It’s not just visual appeal that makes Glass Green Photo Frames instantly attractive. PPM’s new designs provide versatility in vertical and horizontal displays with multiple mounting and functionally attractive standoff options for a higher-end appearance with Glass Green Poster Holders. Keyhole attachments in the back of the Photo Frame keep mounting hooks behind the signage so hardware can be kept hidden from sight. End users can also move Display Holder posts to switch from vertical to horizontal displays and vice versa, accommodating a wider range of print materials. 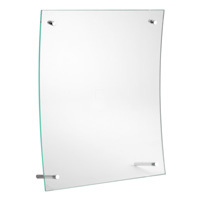 This is where Glass Green Poster Holders can really show their effectiveness as showcases for portrait or landscape display alternatives. 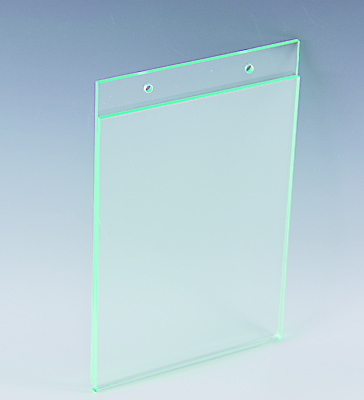 Glass Green is an extremely tough plastic with a .098 thickness. It’s remarkably similar to actual glass in appearance yet carries higher visual acuity characteristics, guaranteeing that no text, graphics, or photos will be lost to the eye. The sturdy composition also makes Glass Green Photo Frames and Poster Holders able to stand up against hard knocks, especially in high foot traffic areas. Another attribute of PPM Style W2 Glass Green? Size. While standard Glass Green Photo Frame sizes are 4” x 6,” 5” x 7,” and 8-1/2” x 11,” all are customizable to any desired specifications. 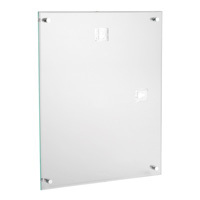 That same versatility holds true in different Green Glass Beveled Poster Holders. PPM Customer Service Representatives can work with you on varying size requirements and customization options should you be interested in personalized displays. 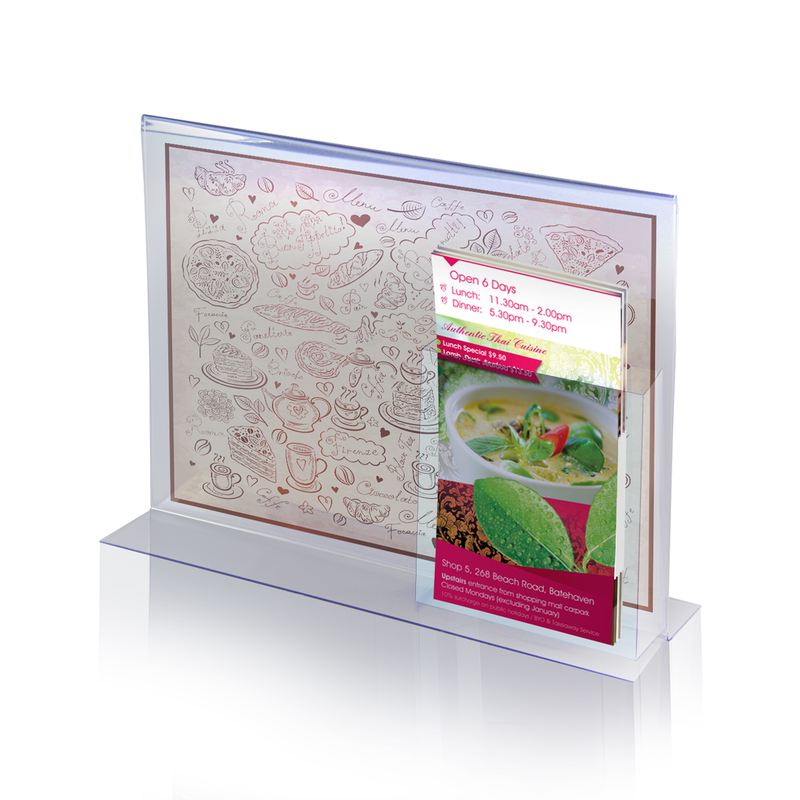 Give your print and promotional literature a fresh look with a Glass Green tint. 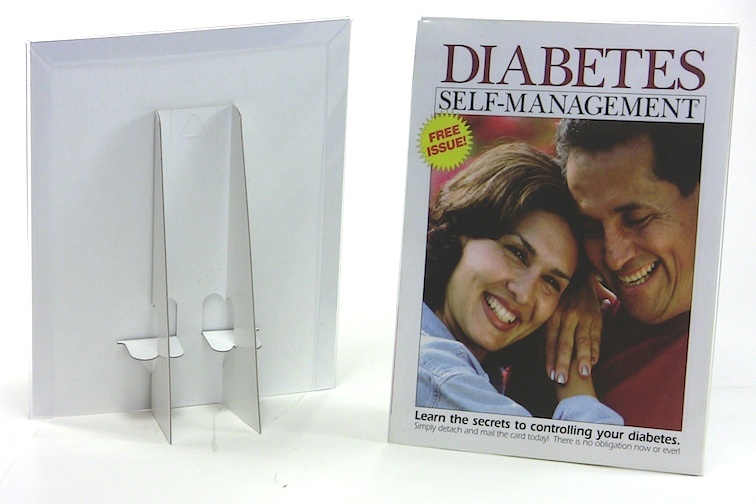 Whether for use as aesthetically appealing informational signage on campus or as a way to command attention in POP displays, take a closer examination of PPM’s Style W2 Glass Green Photo Frame and Poster Holder options in our online catalog at www.plasticproductsmfg.com. Special pricing is now available to help introduce the beauty and effectiveness of Glass Green Displays to the marketplace. Be sure to note the dramatic volume price breaks on bulk orders, too. With well-stocked inventory on the floor, orders can be processed for fast shipping right away! The Holiday Season tends to bring out the more charitable qualities in people…a perfect time to help capture their contributions and show their generosity in the best light possible. Of course, Americans have a reputation for their giving nature year round according to statistics from the National Philanthropic Trust, showing that charitable donations last year alone reached over $335 billion. Interestingly, 72% of that total came strictly from individual donations. But it’s during the holidays and into a promising New Year when those one-on-one contributions are magnified, and Plastic Products Mfg (PPM) has an exemplary line-up of Acrylic Donation Boxes to help worthy causes of all sorts looking for a boost during this giving time of year. Clear Coin Boxes and Large Acrylic Donation Boxes have played a prominent part in fundraising activities for decades. Today, hundreds of thousands of dollars a year are raised through Donation Box contributions at national parks from the Great Smoky Mountains to Hawaii’s U.S.S Arizona Memorial. It’s also true that charity begins at home and you likely see PPM Donation Box styles where you shop locally. From Mini Coin Boxes at neighborhood pharmacies to 5” Wide Donation Boxes with Headers at corner markets, there are many design and style options that all deliver grass roots success. Another key factor in successful campaigns using Acrylic Donation Boxes? Customization options make a memorable impression that helps seal a bond with potential donors. This form of “brand recognition” gives people a visual aid to identify with and encourage contributions. 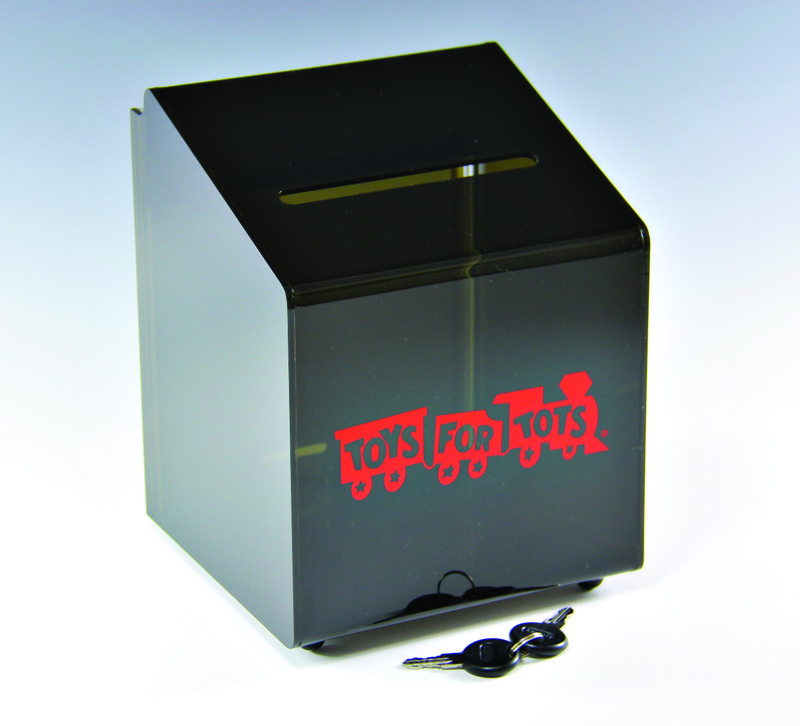 For example, we custom imprinted the Toys for Tots logo on a Smoked Acrylic Donation Box, making a clear connection with the public by showing a credible, recognizable name and logo. Consider custom imprinting for your Suggestion Box and Donation Box campaigns…the results can be significant towards your ROI. From thrift shops to co-ops and boutique stores to retail centers, foot traffic is at its peak now. 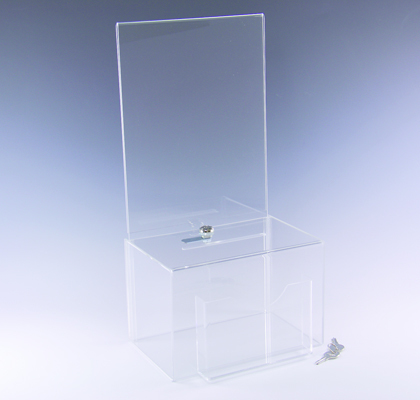 PPM’s versatile range of Acrylic Donation Boxes gives you value-added options in promotional areas as well as security. You can add text, graphics, and color to Donation Boxes with a 6” x 4” Postcard Header. 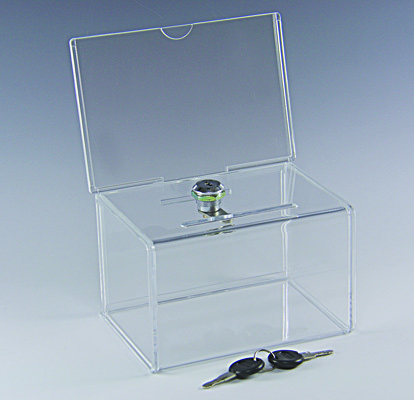 If box locations aren’t always secure or easily monitored, you can always get a Donation Box with a lock mechanism to complement the tough acrylic thickness. 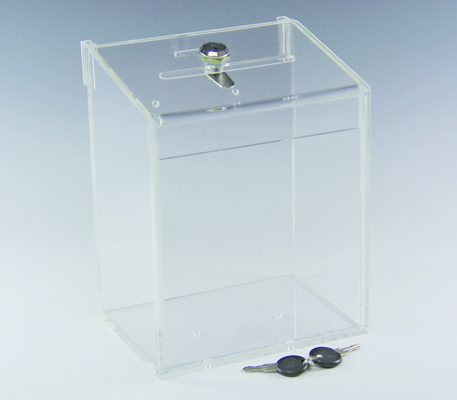 Some PPM “Box and Lock” styles utilize a top-locking mechanism but be sure to note Large Donation Box styles where the mechanism is hidden from sight underneath…particularly on the aesthetically appealing Smoke Acrylic boxes. At a full 6-1/2” wide x 8-1/8” high x 6-1/4” deep, PPM’s Smoked Acrylic Comment and Coin Box delivers excellent storage capacity and a unique look that also protects its contents. Where clear acrylic offers a transparent view and invites even more community support the more it fills, Smoked Acrylic Donation Boxes offer the same allure by sheer design and good looks. Yet the interior remains more obscured, serving as a form of theft deterrent in higher risk locations…another reason why a hidden bottom locking mechanism serves a valuable function. Food pantries, church organizations, volunteer fire departments, little league baseball…the potential to make a difference applies to practically any worthwhile organization, charity, and non-profit. But applications for Large Acrylic Donation Boxes extend beyond coins and bills. Businesses and government agencies also rely on PPM Suggestion Boxes to perform a very valuable function: collecting feedback. As you make operational resolutions for the new year ahead, now’s a perfect time to reflect on the past year and get input from your staff and/or customers to see where improvements might be needed. Everyone likes to be heard and displaying a nice-size 11” Wide Suggestion Box will definitely encourage opinions en masse. Acrylic Suggestion Boxes can complement your current POP Display in retail settings, entrance/exit areas at local government buildings with heavy foot traffic, and in the office where the next great business idea could just end up inside! Take a closer look at PPM Acrylic Donation Boxes and Suggestion Boxes in our online catalog at www.plasticproductsmfg.com. Now’s the perfect time to fill ‘em up!